Meet the mastermind! 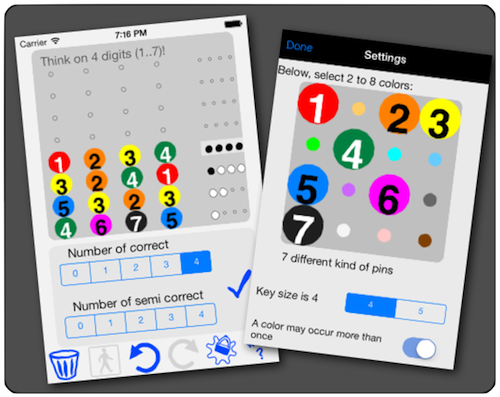 This is NOT the Mastermind Game from the 1970:th -but a SOLVER to that game! YOU think of the secret code and the AI robot cracks it. It is a very good code cracker! -Spooky, it reads my mind! Congrat, the tool is currently aviable at App Store ! The number of correct digits in the guess. Both color and position must match. The number of the remaning pins that has the correct color. Typically, the AI will nail down your secret within a few guesses. Yes, it is quite spooky! The colors of those pins. If the same kind of pin may be used multiple times or not. Touch the waste basket to erase the game and start over. Undo any number of times. If you regret undo, touch redo.